The Bottom Line: Finally, a true barefoot shoe, in fact Taloppa’s are The only “barefoot” shoe that actually leaves you with a “bare foot” while you’re still able to enter areas where it’s considered socially unacceptable to be unshod. If you enjoy barefoot living, get some for yourself now. Running barefoot is a sheer joy to me, and I find that I often prefer to go EVERYWHERE barefoot…not in “barefoot shoes” or minimalist footwear, but truly and totally naked foot barefooted I just don’t like wearing little foot-shaped coffins on my feet. While I can always put on a pair of flip-flops or “J”uaraches, I’m always looking for a little something different. Enter the Taloppa Barefoot Sandal. I contacted Taloppa as soon as I saw their facebook page, expressing an interest to test and review their product. Within hours, I received a response from Marty @ Taloppa. Yes, in fact they would love to have me review them, with the caveat that it is more of a casual sandal than it is athletic footwear… I sent off my address and color preference and then sat by the door like a kid on Christmas. Please note that this was on a Tuesday. I clipped off the excess straps and heated the cut with a butane candle lighter to prevent fraying as per the instructions, and then I set about getting used to walking around in them. For a simple product, the Taloppa Barefoot Sandals have a definite “sweet spot”– If you don’t get them on “just right”, you immediately realize something is wrong. Without too much trouble, I finally got them adjusted correctly, and I couldn’t be happier with the feeling. Sidewalk? OK! Just like being Barefoot! Stepping on a cactus in these is not a good idea. MuddyJ: First things first: What led you to conceive and create the Taloppa Barefoot Sandals? Marty: The idea really came about a few years ago when I began to experience some foot problems. To make a long story short I did some research that seemed to suggest spending more time barefooted in normal day to day activity might be helpful. However, simply walking around the house or going out to the mail box barefooted wasn’t working. I needed to find a way to make barefoot living more a part of my everyday life. MuddyJ: Where does the name “Taloppa” come from? Marty: The name Taloppa is loosely derived from two foreign (Icelandic) words ‘Ta’ for toes and ‘Loppa’ for paws. Muddyj: Would you consider/call them “Vegan-Friendly”? Marty: In terms of ‘Vegan/Friendly’ I really haven’t though much about it, but the fact remains that animal products (ie leather) are not used in the manufacture of our sandals. I do believe our sandals are ‘Environmenal Friendly’ in that only a fraction of raw materials needed to produce conventional footwear – even flip flops – are needed to produce a pair of our sandals. Marty: I do wear my sandals frequently. Just to name a few places: coffee shops, restaurants, book stores, the mall. movie theaters, side walk art shows, farmer’s markets, etc. I’ve worn them to hundreds places such as these over the past 3 years. Although my foot problems have subsided, I continue to wear my Taloppa Barefoot Sandal because I truly enjoy the barefoot lifestyle, and these sandals have made it possible to take this lifestyle with me practically anywhere, anytime. My ‘Rule of Thumb’ is that if I’m going somewhere that flip flops are considered acceptable footwear then Taloppa Barefoot Sandals are also acceptable footwear. MuddyJ: After showing them to a lot of my barefoot running friends, the top question has been why or what’s the point? How would you respond to that question? Marty: The point behind wearing them may be a little difficult for someone to understand if they don’t really enjoy going barefoot. Someone who really enjoys going barefoot would like to do so as often as possible. However, the ability to do so is limited. Some sort of minimalist foot wear – footwear that still have soles – is one option. The other is to go completely barefooted and incur the disapproval of people in places such as the ones I’ve listed above. Our sandals were designed to bridge the gap between the shod and shoeless lifestyles by creating a form of footwear that, on the one hand, is socially acceptable practically everywhere flip flops would be, but at the same time makes the barefoot lifestyle a reality in everyday living. The following is from a document that I use to describe our sandals for a Barefoot Runner’s give away that I think says it best. 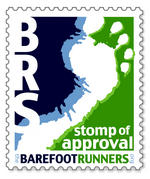 The barefoot lifestyle no longer has to end after you cross the finish line. Bridging the gap between the shod and shoeless, Taloppa Barefoot Sandals make it socially acceptable to experience the barefoot lifestyle practically anywhere, anytime. Whether you’re studying for finals at the local coffee shop; browsing at your favorite bookstore; or strolling through a sidewalk art show, Taloppa Barefoot Sandals make it possible to integrate activities such as these into your barefoot lifestyle. Designed to look similar to conventional sandals, Taloppa Barefoot Sandals help dispel the urban myth ‘no shirt, no shoes, no service’ by passing the first test which is ‘shoes’. In our experience, once this first test is passed, there is no second test. So when you’re ready to extend the barefoot lifestyle into your everyday life Taloppa Barefoot Sandals make it possible. MuddyJ: Will I see Taloppa Barefoot Sandals in any retail outlets in the near future? Marty: Right now I have only one retailer that is carrying my sandals in inventory, Golden Temple Health Foods in Birmingham, AL (Facebook here). Chances are I will not expand the retail distribution in the near future due to financial concerns. Muddy J:Do you have plans for a 2.0 line? maybe something with stripes or patterns? A rubber dot liner or coating to keep them from slipping off? a logo on the plastic cams? A day glo orange model? cams in differing colors? Marty: Before I consider a 2.0 line I want to get our current product line off and running. We just published our FB page a little over a month ago and with limited advertising we’ve already had close to 200 ‘Likes’. I would really like to find a way to add more colors and accents designs such as the ones to be found on our ‘Bling’ page on our website, because they make a huge impact on the appeal to not only the wearers but to casual observers. If they are slipping off something may not be right. They shouldn’t be slipping. One issue might be be the way the top cam buckle is fixed. On step four of our instructions we make a point to say “run the cam buckle end over your instep but under the 3′ foot section”. If the cam buckle is on top rather than under, the entire sandal strap will tend to shift or rotate around your foot as you walk. When the cam buckle is under the strap, the strap binds the buckle and keeps it from moving. Overall the strap should be snug but not tight. If it’s snug it shouldn’t be slipping. I’ve considered logos on the cam buckles and this is a definite possibility; however, sales volume will have to increase significantly to make this economically feasible. The same holds true with respect to cams of different colors. Well, that’s all I have for the moment. I will continue to wear and test these amazingly barefoot sandals and re-visit them after I have put some more mileage on them!